Lizzo, the enormously talented and charismatic Minneapolis-based rapper and singer, is about to release her new album Cuz I Love You. 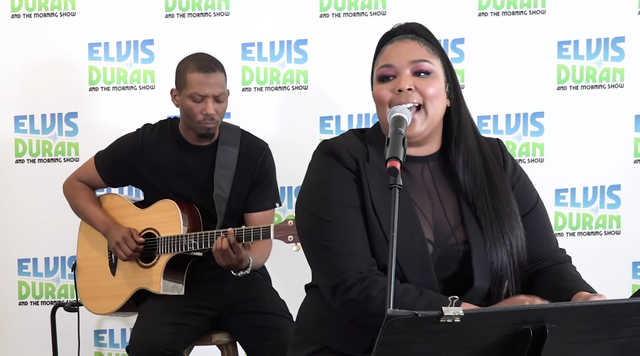 We’ve heard “Juice,” “Tempo,” and the title track, and earlier this week, she covered the Lady Gaga/Bradley Cooper A Star Is Born duet “Shallow.” Now, she’s covered another recent #1 hit, Ariana Grande’s conspicuous consumption anthem “7 Rings.” Watch Lizzo sing it, backed by acoustic guitar, on Elvis Duran And The Morning Show below. Cuz I Love You is out 4/19 on Warner Bros.